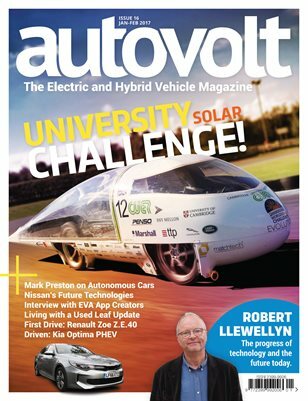 Main features are: • Tom Curtis’ Leaf • LifeStyle Gear • COLUMN: Robert • COLUMN: Mark Preston • FIRST DRIVE: Renault Zoe Z.E.40 • REVIEW: Kia Optima PHEV • FEATURE: University Solar Challenge • INSIGHT: EV Charging. Innovation Needed? • INSIGHT: Should every vehicle be autonomous? • INTERVIEW: EVA app • TECHNOLOGY: Nissan Futures 2 • REAR VIEW: Connected cars, do we need them?